Mr. Mansfield is the Space and Naval Warfare (SPAWAR) Systems Center (SSC) Executive for Network Centric Development and Integration. He serves as the Technical Director of SSC Atlantic (LANT) (Code 01E). Mr. Mansfield is responsible for setting the long-term Technology Strategy of SPAWAR Systems Center, Atlantic in conjunction with the Command’s Chief Engineer, Chief Technology Officer, and Logisitics Competency Lead. He also engages at a national level in charting the course for the Navy’s IT modernization efforts, especially in areas of commercial cloud/cloud transformation, Data Sciences and Analytics, and Cyber Security. 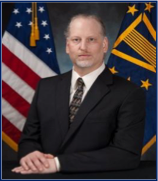 Prior to this appointment Mr. Mansfield most recently served as the 5.0 Competency Engineering lead and Chief Engineering of SPAWAR Systems Center, Atlantic, and the SPAWAR national lead for Net-Centric System-of- Systems Engineering and Integration (SE&I). As the National Technical Warrant Holder for Service Oriented Architectures (SOAs) and Net-Centric Engineering, Mr. Mansfield advised SPAWAR leadership, and other Stakeholders within the Department of Defense (DoD) and Federal sectors on SOA, cloud computing, and agile systems engineering at the developmental and enterprise engineering levels. He establishes and directs engineering teams across the SPAWAR claimancy to produce effective results and further promote SPAWAR as the Navy's single SE&I agent and Technical Authority for Information Dominance. Mr. Mansfield was appointed to the Senior Executive Service as a Senior Leader (SL) in October 2011 and has over 32 years of federal service. Mr. Mansfield also led the modernization of the Veteran’s Administration Chapter 33 GI Bill Benefits capability, and was the SPAWAR National and Local SSC LANT Lead for the Command & Control (C2) and Business Information Technology (IT) Systems Competency as well as the Net-Centric Engineering and Platform Integration Competency. He designed and managed the implementation of cost effective Enterprise/Net-Centric architectures and provided disciplined technical oversight resulting in the delivery of agile, state-of-the-art System-of-Systems (SoS) engineering solutions supporting the development, delivery, and sustainment of integrated, interoperable, and effective C2 capabilities systems and services across both the DoD and Federal sectors. Mr. Mansfield held multiple other lead engineering positions during his tenure at Team SPAWAR resulting in notable contributions and awards for his support to the Veteran’s Administration Office of Enterprise Development as well as the Office of the Secretary of Defense’s Horizontal Fusion Program. Additionally, Mr. Mansfield was responsible for the creation and stand-up of SPAWAR’s SOA University. SOA University was founded to provide a workforce development venue to continually analyze and provide innovative training on emerging technical, programmatic and operational advances. The University, initially focused on the SSC LANT geographic location, has now been deployed across the SPAWAR claimancy and has transitioned to the Workforce Development Office.